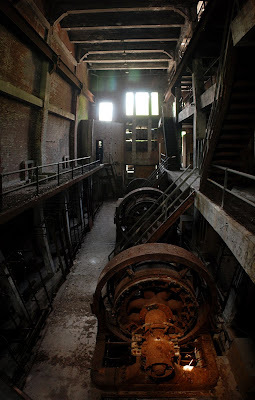 The New York Central Railroad Substation No. 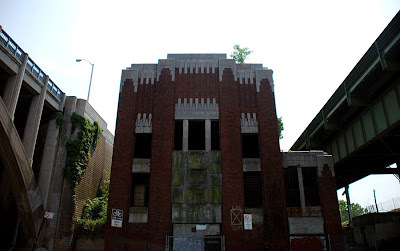 10 is a 79-year-old art-deco building on the northwest edge of Inwood, Manhattan. Located just steps from an active Amtrak line on the Hudson River, the substation is nestled between two Henry Hudson Parkway overpasses. 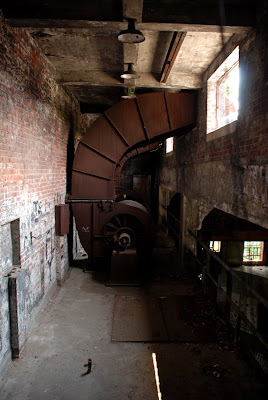 According to a study of the Harlem River done by Columbia University's Department of Historic Preservation, "the New York Central Railroad Substation was built in 1930 to provide electrical service for the trains on the NYCRR’s Hudson River line. 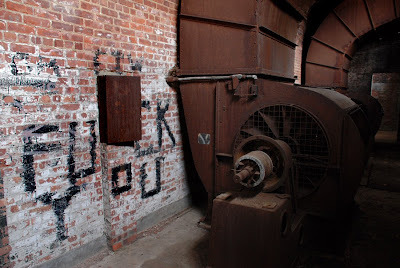 The five-thousand-square-foot, two-room, brick structure is an example of the pre-Columbian style of Art Deco... employing motifs borrowed from Aztec and Mayan cultures..."
Substation 10 has been abandoned for decades, with graffiti and primitive wall drawings that date back to at least the 1980's. 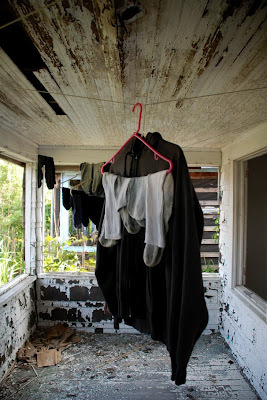 In 2003, an active squatter community was reported by the NY Times: "homeless people scurry in and out through the back windows of the structure... and leave years of clothes, mattresses and Chinese takeout containers scattered around the electrical equipment inside." 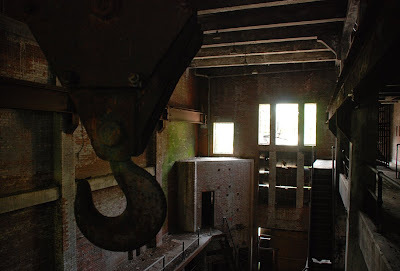 Despite years of neglect, the interior of Substation 10 remained in remarkably good condition. 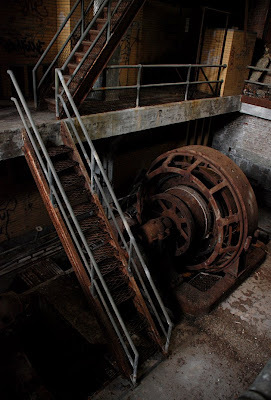 Its massive power equipment, staircases and ventilation systems were rusty, but fairly intact. 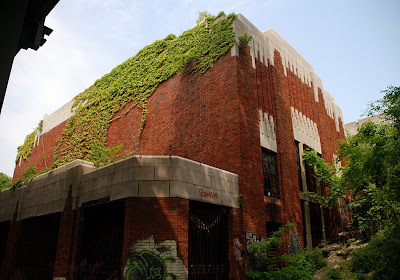 The Department of Parks & Recreation began gutting Substation No. 10 earlier this June. Today, a sign out front explains the building is being "reconstructed to provide public restrooms" and "possible community use." 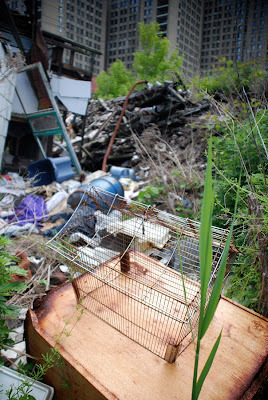 Large dumpsters are slowly being filled with bricks and electrical devices stripped from the interior. No mention has been made of a reported proposal for an arts center with "an upscale Latino restaurant to be built on the top floor." Work is scheduled to be completed in Spring of 2010. 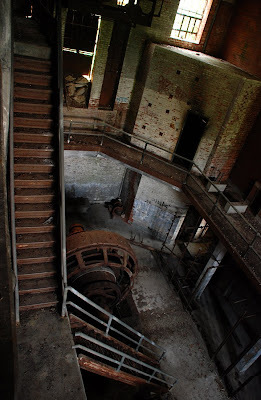 These photos are a last look at the old interior of Substation Number 10, and were taken shortly before its "reconstruction" began. 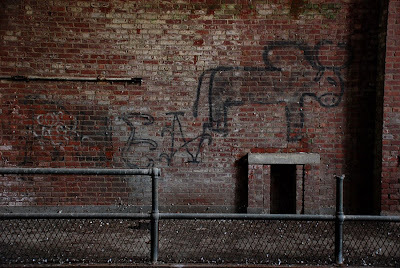 Far Rockaway, on the eastern edge of Queens, was once a flourishing summer community. 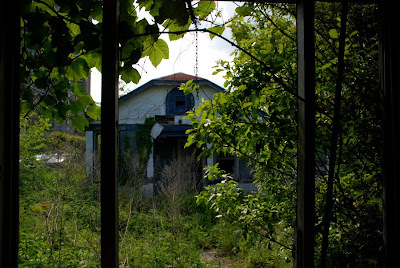 Today, its landscape is like the half-abandoned city of Buffalo, with vast empty lots and a large number of abandoned homes. 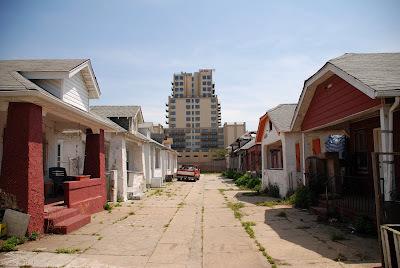 In 2008, according to the NY Times, the Far Rockaway's city council representative called his district "ground zero" of the subprime mortgage crisis. 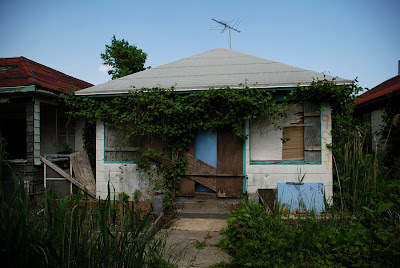 Up until the 1970's, the streets of Far Rockaway were lined with hundreds of summer bungalows. Only a few of these cottages remain. 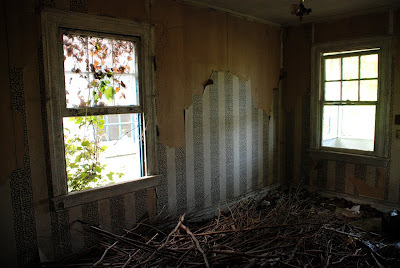 Some are now year-round homes. 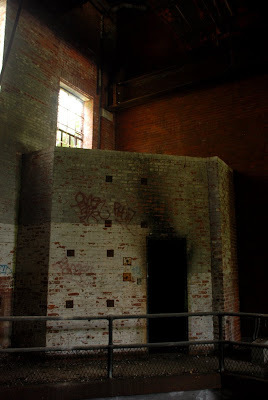 Many have been abandoned, sealed off and covered in gang graffiti. 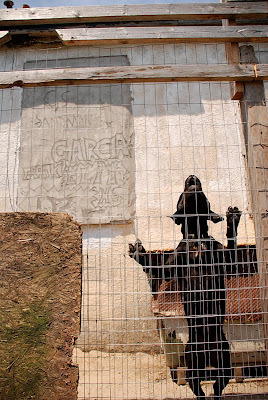 According to neighbors, empty bungalows have been used to stage illegal dogfights. Others are used as makeshift kennels for fighting dogs. 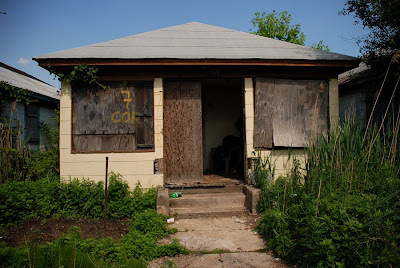 One group of 16 bungalows has been taken over by squatters from El Salvador, according to NY Post reporter Sarah Ryley: "The shacks are in bad shape, lacking water, heat and electricity. 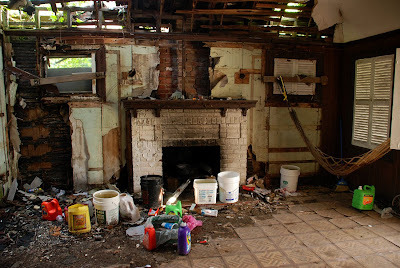 But the few that are habitable have been turned into adequate shelters, complete with front porches, buckets to collect rainwater, and small courtyard gardens seeded with jalapeno peppers and tomatoes." 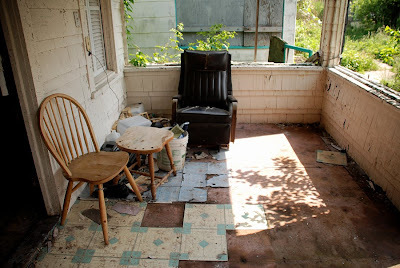 Three photographs from this photo essay were published with that article, titled Squatter Explosion. 80 years ago, Far Rockaway was "the summer getaway of A-List actors," according to the NY Times, which also reports that "in 1929, Groucho Marx owned 24 [bungalows] as an investment." 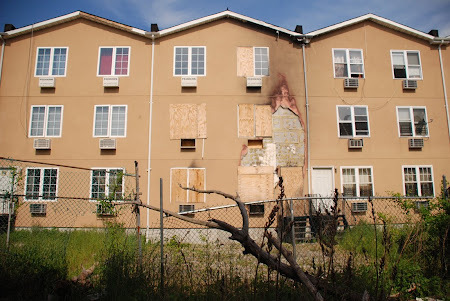 However, "air-conditioning and air travel spelled the end of Far Rockaway’s heyday, and half a century later it hit rock bottom, with high crime, [and] wrongheaded urban-renewal schemes." 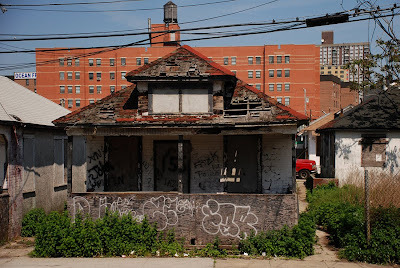 The Rockaways' "tortured development history," according to City Limits, created a neighborhood where "in place of the empty lots and dilapidated homes, speculative developers built condos and apartments.... almost all of the new homes never sold. 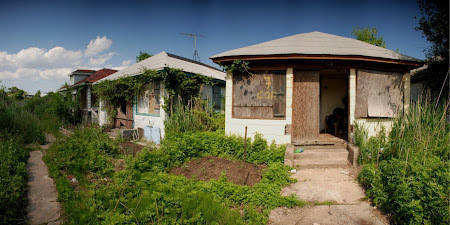 Today they are not occupied by homeowners, but by subsidized tenants with limited disposable income..." The NY Post reported in May 2009 that "of the 126 two- and three-family homes built in the neighborhood between 2004 and 2006, at least 76 percent have been foreclosed on or are currently in some stage of foreclosure." 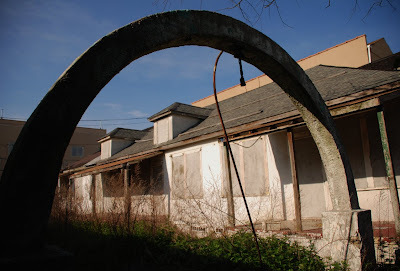 The future is uncertain for the remaining bungalows of Far Rockaway. 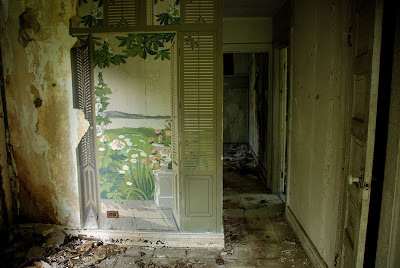 Some are slated for demolition by developers. 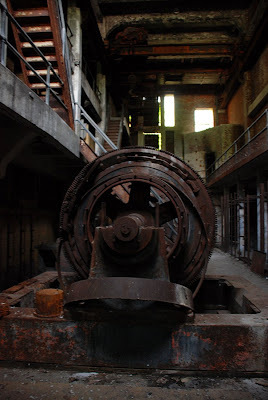 Others are collapsing under the weight of abandonment. 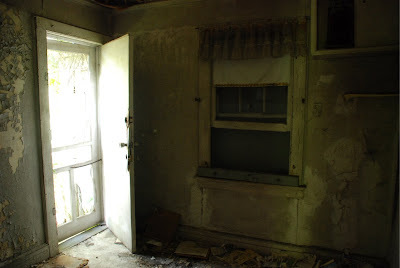 A few that are in good shape are part of The Beachside Bungalow Preservation Association. 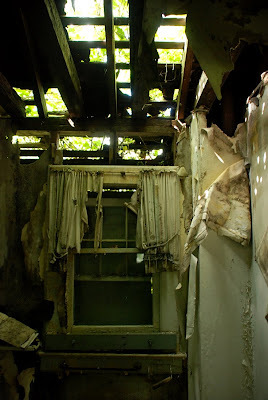 The following photos document the last of Far Rockaway's abandoned bungalows. 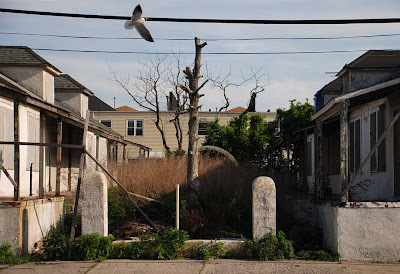 For more photo essays from The Rockaways, please visit Hammels Wye (2010), The North Edgemere Shore (2010) The South Edgemere Wasteland (2010) and The Edgemere Landfill (2010).